By recognizing industry trends and implementing the expertise and know-how of hunters and competitive shooters, Hornady has outperformed its competition by providing their customers with the products they need and accurately predicting their future needs. The company has embraced the importance of ammo as its livelihood and as an integral part of its day-to-day activities. 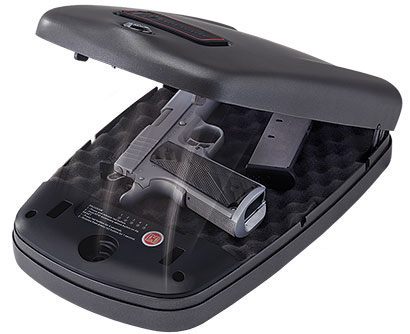 Along with their passion for ammo comes the inevitable need to safely secure your firearm for when it’s needed most, which is why the new Hornady RAPiD Safe 2700 was developed with the specific purpose of addressing these safety concerns. The Hornady RAPiD Safe 2700 combines sleek styling and heavy-duty construction with fast, touch-free entry and a child-resistant design. This next-gen safe accommodates most four-inch revolvers and full-sized handguns. Use an RFID wristband or an RFID key fob (both included) to instantly open its spring-assist lid. New for the safe is the Hornady Security RFID Sticker; this easily turns any everyday item, such as an iPhone, for instance, into an RFID option that allows quick, easy access to your firearm by simply attaching the sticker to it. Additionally, it can also be opened with a traditional key lock. Note: Do not store loaded firearms in any safe or lock box. Follow local laws for firearm storage. 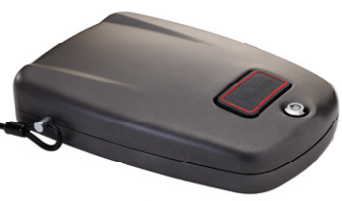 Check TSA regulations and airline policies before traveling with any portable safe. Firearm and firearm accessories are not included. With over 80 years of rich history and tradition to its name, Rocky Boots is known as a worldwide leader in the development, manufacturing, and marketing of premium-quality, rugged, outdoor, work, Western, duty, and military footwear, along with outdoor work apparel and accessories. Their durable, innovative products are consistently constructed with new, quality fabrics and cutting-edge designs, thereby giving their active, engaged clientele the confidence to succeed. 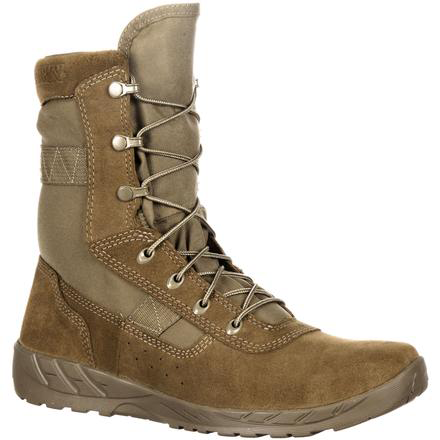 Fully embracing these hallmarks of excellence and innovation are the new Rocky C7 CXT Lightweight 8-Inch Military Boots, which are specifically designed to be uniform- and GSA/TAA-compliant. Each boot weighs less than 15 ounces and is designed for great durability. The Rocky C7 CXT Lightweight 8-Inch Military Boots feature a sturdy, triple-stitched construction that firmly holds them together, easily resisting daily wear-and-tear damage. Available in a stylish coyote brown, the boots are extremely flexible with uncompromising support to the wearer’s feet. They can be quickly and securely put on, thanks to speed-lace eyelets and NATO hooks. Designed to offer premium comfort for hours of use, the Rocky C7 CXT Lightweight 8-Inch Military Boots’ Vibram® rubber outsoles offer high levels of performance, and superior breathability keeps your feet cool. Additionally, the boots are equipped with Ortholite® memory-foam footbeds and padded collars. Choose among two widths, medium and wide, and from a large, varied selection of sizes, ranging from four through 15. Regardless of what degree of skill you possess as a shooter – hobby shooter, competitive shooter, military-, or law-enforcement-trained shooter – PACT knows very well that there’s always room for improvement. This is why they develop all their products to give shooters the necessary tools to achieve quantifiable improvement. One such product is specifically designed to do this and so much more: the PACT Club Shooting Timer III, which is regarded as the ultimate timer for running matches and increasing shooting speed. The ideal way to improve hit time is by diligent practice, so you need the PACT Club Shooting Timer III to record and display all relevant data related to your shooting in a simple, straightforward manner. Featuring a rugged, impact-resistant, and ergonomically designed case, its purpose-built, easy-to-read display offers a wealth of information pertaining to a shooter’s shot string, shot number, and total time. Each value is clearly highlighted, without any button-pushing needed. Use the PACT Club Shooting Timer III’s “Review” function to display each shot’s total time and split. If any PAR time is available, it will be displayed along with an indication of whether the time is set to a “Delayed” mode (allows a delay of 2 to 3.5 seconds before its extra-loud, custom-made buzzer rings) or an instant “GO”. In “Instant” mode, the “GO” button is pressed and held on the “Shooter Ready?” command and the buzzer will sound instantly when the “GO” button is released. Designed to conveniently fit in your hand, the PACT: Club Shooting Timer III’s custom-made buzzer and its microphone are located near its side, away from your hand, thereby reducing the possibility of blocking them. All control buttons are recessed below its top, which nullifies the chances of accidentally pressing them when running with it. When you need to press a button, you’ll find that they are naturally positioned beneath your fingers, so you won’t need to hunt for them. Additionally, its custom-sealed, conductive-rubber keypad is waterproof, so you won’t need to worry about mechanical switches failing at inopportune times. Additionally, it uses a single, nine-volt battery (included) with an auto-power-down feature that kicks in after 15 minutes. With crisp fall temperatures on the horizon, Under Armour (UA) is equipped to offer a complete line of stylish seasonal selections that will keep you warm and comfy. Perfect for a wide variety of outdoor-based activities and specially designed to protect against temperatures ranging from 0 degrees Fahrenheit to 55 degrees Fahrenheit, the UA ColdGear Borderland Flannel Long-Sleeve Shirt is ideally suited to be worn casually on chilly days. 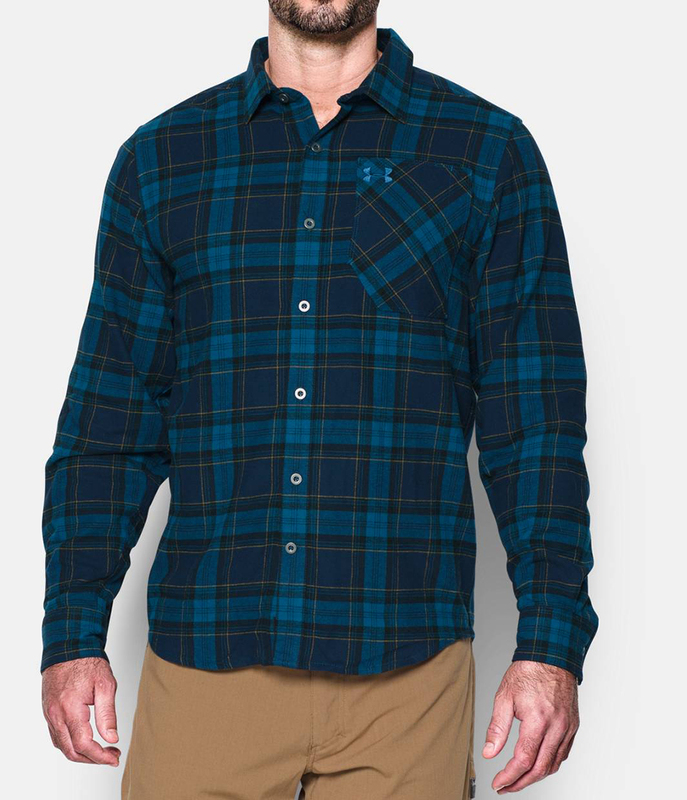 Featuring a fuller cut and looser fit that results in complete comfort along with unrestricted mobility, the UA ColdGear Borderland Flannel Long-Sleeve Shirt is comprised of a 60 percent cotton / 40 percent polyester, soft-brushed, flannel fabric. 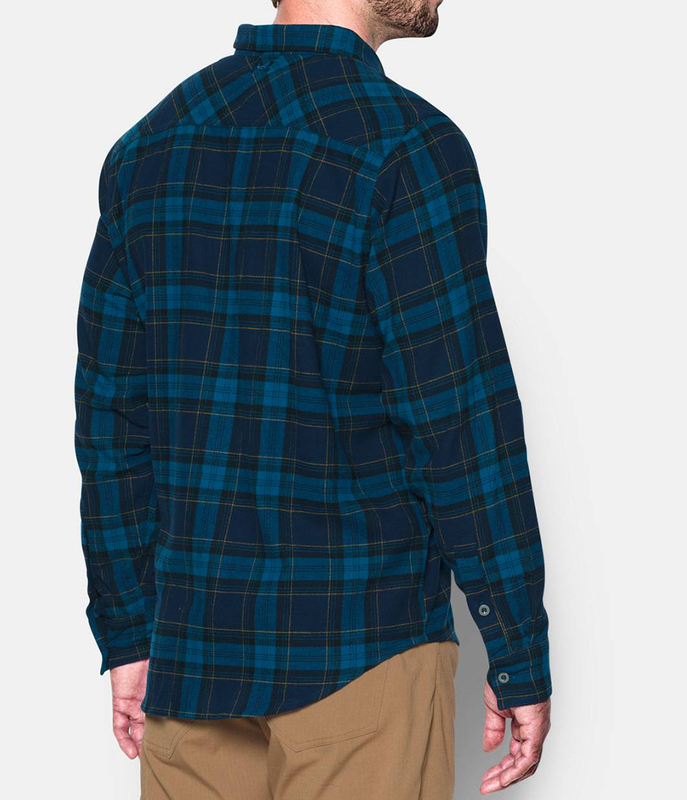 Capable of efficiently wicking away sweat and other moisture with its Moisture Transport System, you can be assured that you’ll stay dry and warm while wearing it, thanks to its innovative Charged Cotton ®, which offers the comfort of cotton, coupled with efficient, quick-drying capabilities (five times faster than regular cotton).